Hearing aids alone are an excellent solution to most patients with hearing loss. However, it is important to understand that hearing aids do have some limitations especially when distance, background noise or poor acoustics are factors. In these situations, accessories can complement a user’s hearing aids to improve communication and effectiveness. Wireless accessories. Utilizing Bluetooth® technology, wireless accessories enable you to hear better in situations where there is a lot of background noise or distance between you and the speaker. These include wireless microphones, remotes and television headsets. FM (frequency modulated) systems. FM systems amplify speech in situations where background noise, distance and reverberation can make for a difficult listening situation. FM systems consist of a microphone that is placed close to the speaker, a transmitter and a receiver that forwards the signal directly to the user’s hearing aid or cochlear implant. These can also be helpful in educational situations (a teacher’s words are transmitted directly into the student’s ears) and for children. Power adaptors and cords. These add versatility and convenience by allowing hearing aids to have direct input from various audio sources (FM systems, MP3 players, TVs and computers). Available with both monaural and binaural configuration depending on if you have one or two hearing aids. Assistive listening devices/personal amplifiers (ALDs). ALDs function as personal amplifiers that separate speech from background noise and amplify sounds. They are similar to FM systems and help to overcome many of the same limiting factors such as background noise, distance and poor acoustics; in addition to a frequency modulated signal, they might also rely on infrared technology or inductive loop systems. ALDs are helpful in educational settings, places of worship, television, and movie theaters. Wax guards and filters. Filters prevent earwax, a leading cause of damage to electronic components, from entering the hearing aid. This helps prolong the life of the device and provides you with a clear, natural sound. Cleaning kits. Keeping your hearing aids clean can result in a longer life for your instruments. Most cleaning kits include a wax removal brush and pick, a tube and vent cleaner, battery door opener and battery replacement magnet. Batteries. It’s wise to have extra batteries on hand in case your current ones die in the middle of an important listening situation. Especially helpful when you’re traveling. 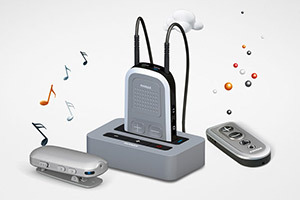 Additionally, some hearing aids are now available with rechargeable battery kits.